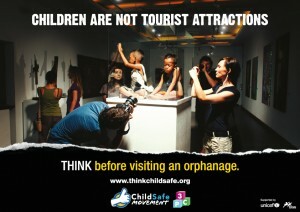 Why are we asking you to rethink donating to or visiting orphanages? Sixty years of research demonstrates that institutionalisation seriously harms the health, development and future life chances of children. Research shows that in a majority of cases in developing countries, poverty is a driving factor. The more funding that goes toward residential care centres, the more appealing they become for struggling families, who become convinced their child will have a better future in the centre than at home. Nobody doubts the good intention of the donors, travellers, and volunteers who give time or money to orphanages. It is natural and right to care about poor and vulnerable children, wherever they are in the world. But is this support part of the problem rather the solution? Child protection practitioners believe orphanage tourism, volunteering, voluntourism and donations instead of being part of the solution, are in fact part of the problem. How? By both creating and fuelling the demand for “orphans” which in turn drives the unnecessary separation of children from their families as well as making them vulnerable to potential abuse and even trafficking and slavery. To help children, support their families and communities. Our aim is to harness the generosity of well-intentioned donors and volunteers, and to redirect support away from Residential Care Institutions – Orphanags- towards organisations who are working to keep children in families. By doing this, we can ensure that vulnerable children have what all children need and deserve – a family. Halting the exploitation of children, donors and volunteers requires collaboration and cooperation between national governments, the tourism industry, charities, faith organisations and other non-government organisations as well as travellers and volunteers themselves. Cross-border cooperation and a commitment from both the supply and demand sides are vital. We all bear responsibility. While there remains a demand for orphanage visits and philanthropy in developing countries and little is done to stop it, new, unscrupulous suppliers will continue to emerge. Have you donated to or volunteered in an orphanage or residential care centre – or are you thinking of doing so? Please contact us and we can put you in touch with appropriate organisations in the relevant regionwho can advise you in facilitating donations and can offer support regarding your experience.. However you choose to donate or volunteer we encourage you to do your RESEARCH and ASK the right questions -and AVOID creating more “orphans”.